They came from everywhere — Austria, England, Ireland, Canada; they heard from everyone; they came to experience EKK live . . . Kaua’i was a-buzz all week with word that the special guests for Monday were Kumu Hula O’Brian Eselu, Halau Ke Kai o Kahiki, Kenneth Makuakane, and Kekai Chock. My phone was ringing off the hook all day with folks asking for directions and details, and I would say, “Come early; it might be standing room only.” One person asked, “You mean there won’t be any chairs?” Hotel staff brought out every chair, every plastic chair, the carpeted floor close to the stage was filled, and many chose to stand so they could see the stage action. It was a packed house. How do people find out about EKK? Many say they found out from Uncle Louie Amadova down at Salt Pond, or from Expedia’s Jane Kiilau, from some person in the Wal-Mart parking lot, or from the “wall-nuts” and “snowbirds who congregate down by the Poipu Sheraton stone wall to watch the evening sunset. Whenever a visitor to Kaua’i asks, “What is something that I should not miss while on Kaua’i? '” the quick answer from everyone “in the know” is EKK Monday at the Kaua’i Beach Resort. Each week when I ask how many folks are new, at least a third of the crowd stands up. This week there was a huge native population coming through the doors….uiha! A record-breaking crowd enjoyed a fun evening of “ordered chaos” or “chaotic order” depending on whether you were a participant or an observer. The first hour was like a huge bazaar with something going on everywhere. First time visitors were greeted at the entrance and lei’ed by Aunties Fran Nestel, Marj Dente, Barbara Wells and the team of lei-makers; Kenneth Makuakane and 46 ukulele players were learning “Ma’ili Paka” in their circle to the back; O’Brian was on stage teaching 77 wanna-be and experienced hula dancers how to dance beautifully; two male hula dancers were to the side of the stage teaching the kumu hula and experienced dancers how to do the aggressive male version of the hula; EKK volunteers were signing on new folks and giving them the low-down on the evening; hungry folks coming from work were enjoying the pasta plate and drinks at the cafe tables near the food concession; there was wala’au, wala’au, wala’au everywhere as many were meeting old friends they had not seen for awhile; and the die-hard seat-savers never moved from their seats for fear that someone else would pounce on it. Watching O’Brian teaching the hula circle, one gets a glimmer of how he is able to get his dancers to dance like they do. Soft spoken, he gently demonstrates how dancers hold their fingers, sway their bodies, move their feet; then his “Commanding General” voice snaps everyone into action to move as he wants them to move, dance with grace, sing out with conviction. Back and forth, soft words, sharp commands — “kaholo! smile! sing out! louder!” — the bodies moved in unison. Such exhilaration on the faces of the dancers. Practice, practice, practice . . . hula is demanding. Learning from a master is not for wimps. The 77 hula dancers can add a big feather to their resume: “Learned hula from Kumu Hula O’Brian Eselu.” When O’Brian called them up to the stage to dance before intermission, the entire group moved in unison and danced with grace and expression . . . after one short hour. Not so shabby! He opened by singing “Pua o ka Makahala,” composed in 1916 by Katie Steven I’i, grandmother of Vicki I’i Rodrigues. Her daughter Nina Keali’iwahamana gave O’Brian permission to record this song. It was on his first CD “Ke Kumu” for which he received most promising new artist award at the Na Hoku Hanohano. O’Brian introduced his two male hula dancers for the kahiko hula. In his candid style, O’Brian tells the audience that Carol’s group (EKK) could afford only two dancers. Any more and the stage would have been too small . . . the two twenty-one year old dancers more than filled the bill. Such shy and respectful young men in their Clark Kent disguises, I could barely get their names from them as they were helping me bring all my EKK ukana from my studio to the hotel. But when they exploded into action on stage, one gets an indelible visual image of the words Hawaiian Superman. Dressed only in their poofy kahiko outfits, lei alilea and body tattoos on their muscular physique, Ali’i and Sonny of Ke Kai o Kahiki needed no words . . . action speaks louder than words. The first number was “Pa’i Umauma,” a chest-slapping hula for men that originated in Niihau and came to O’Brian by way of Lokalia Montgomery who learned it from a fisherman named Keale; her teachings were passed on to Aunty Aggie Cope of Wai’anae, whose hanae son is now the Governor of Hawai’i, Neil Abercrombie. This hula takes the mild childhood “patty cake” hand motions to aggressive intensity and complexity. With intense concentration and rippling muscle action, the dancers use their bodies as the hula instrument — swiftly slapping their thighs, chest, arms while swaying their torso and back-bending to the floor — as O’Brian chanted and slapped his ipu heke. The audience approval rang out loud and clear. The second kahiko number or Hula Ohelo titled “Tu Oi” (stand erect) is unique to the islands and is reserved only for the most experienced dancers or nobility and not danced by beginners or children. According to research, it was last danced on the Ewa Plains in 1851. Starting with the subtle gyration of the hips and escalating to physically demanding floor action, the movement of the dancers made television aerobics look like kindergarten exercise. The hula was athletic but at the same time very sensual with all the suggestive arm and hand motions; definitely not to be danced by children. Training, training, training and a powerful 21-year-old physique to carry out the moves was evident to all. How did O’Brian get involved in teaching hula? In 1979 when he was 23 years young, Thaddeus Wilson asked O’Brian to teach the “leftover” dancers because they wanted to enter the Merrie Monarch competition. Reluctantly, O’Brian took on the task and when they went to Hilo, they were definitely the underdogs and received little applause when called to perform. When the awards were being announced, they first called the third place winner, the second place winner . . . at this point they felt downcast knowing the competition was so stiff . . . but when their halau was called as first place winner, the gentlemen in his halau fell to the bleachers and started to cry. They were overjoyed that they had been able to prove that underdogs could come out on top. Today, Halau Ke Kai o Kahiki is well known in the world of hula, having won the “Overall Award” at the Merrie Monarch for the past two years in spite of having only a male halau. O’Brian is equally passionate about composing music. “Ma’ili Paka” written about the special beach park on the way to Wai’anae is the hula and song he shared with the audience. He also shared the way the song “Lanikuhonua” was composed. As he was waiting for his class, he strummed his ukulele and watched the ocean waves crashing and the honu playing in the water, the breeze swayed the tall coco palms and the soft rain appeared — all good omens; the words came to him and the music followed. As he sang, his hands moved to the hula motions showing the beauty of heaven meeting the earth. O’Brian introduced his long time friend and musical arranger, Kenneth Makuakane, highly respected in the world of Hawaiian music and inducted into the Kamehameha Schools Alumni Gallery Hall of Fame. Don’t let his deadpan expression fool you. Composer of thousands of songs, producer of over a hundred albums, winner of twelve Na Hoku Hanohano awards, Kenneth’s brilliant command of Hawaiian music and generous spirit of sharing and teaching others has endeared him to many from the young aspiring songwriters to highly accomplished performers. He shared a set of his favorite compositions and music from the four new CD’s he produced during the holidays. This is mind-boggling as I know many musicians who have spent up to four years or more trying to complete one CD. Two ukulele numbers from his ukulele album, a song about falling in love, and a song he wrote for his cousin’s tenth anniversary were the songs he sang. Once upon a time Kaua’i was not Kenneth’s favorite island, but through EKK, the Koke’e Hawaiian Music Songwriters Camp, and the Kaua’i Music Festival, Kenneth has been spending more and more quality time on Kaua’i sharing his expertise on the technical aspects of recording music, getting a grip on the business aspects of the music industry, teaching songwriters how to collaborate and write their leo, and generously sharing access to his 50,000 Facebook fans. He is the man to have in your corner. Kekai Chock was brought on board for the evening by O’Brian’s request. I could not dig out of either the history of their friendship but it must have been their younger kolohe days because they just looked at each other and grinned. O’Brian said, “I knew Kekai when I weighed 450 pounds and Kekai had more hair.” Kekai, easily one of the most humble and talented guitar players on Kaua’i, is one of the few guys I know who can listen in on a new song once and then join in with unbelievable riffs and pa’ina. Another great guy to have in your corner. The house was packed with hula dancers; they loved the second half when they were invited to go up on stage to dance. O’Brian launched into a series of well-known Hawaiian hula standards; dancers came out from everywhere and danced their hearts out. Each hula school has a different interpretation of the words so there are several different versions of the same song being danced simultaneously . . . but it all flows so beautifully like it was choreographed like that. Kamealoha Forrest of Hanalei ran up on stage for “Kaulana Wale o Kaua’i”; “Aloha Kaua’i” brought up dancers in Aunty Maiki Aiu’s lineage as well as many others. “Ka Uluwehi O Ke Kai” and “Hula o Makee” are hula favorites and packed the stage, floor and aisle. “Pua Ahihi” by Maddy Lam and Mary Kawena Pukui brought Lady Ipo up to the stage. A cheering audience showed how much they loved to be surrounded by hula dancers. By the time all joined hands to sing “Hawai’i Aloha,” people were ready to camp out because the feeling prevailed that everyone in the whole room was now their BFF — best friend forever. Sharing music, dance and a magical experience full of aloha does it every time. Valentines Day – WEAR RED!! 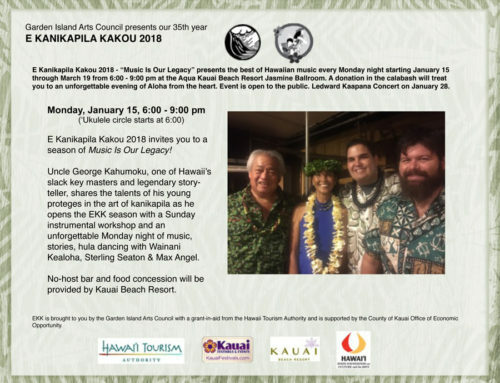 Lady Ipo Kahaunale and her Na Hoku Hanohano award-winning daughter, Kainani Kahuenaele, will share an evening of music and hula. Lady Ipo is highly regarded on Kaua’i with her mutiple talents as singer, emcee, Pied Piper of hula dancers and ambassador of Aloha. Kainani’s voice is a Gift from God and her skill as a composer of Hawaiian music is highly regarded among musicians. Born and bred in rural Anahola, she matriculated and now teaches Hawaiian studies at University of Hawai’i Hilo Campus. What a perfect Valentine’s Day gift to yourself…be there! Kauai Beach Resort EKK Special: NO MINIMUM Stay. EKK Promotional Rate of $139 plus taxes include parking, good from Sun – Thursday. Good for all EKK fans locally, nationally and globally. Based on availability at the time of booking. If you have a disability and need assistance call Carol Yotsuda at (808) 245-2733.